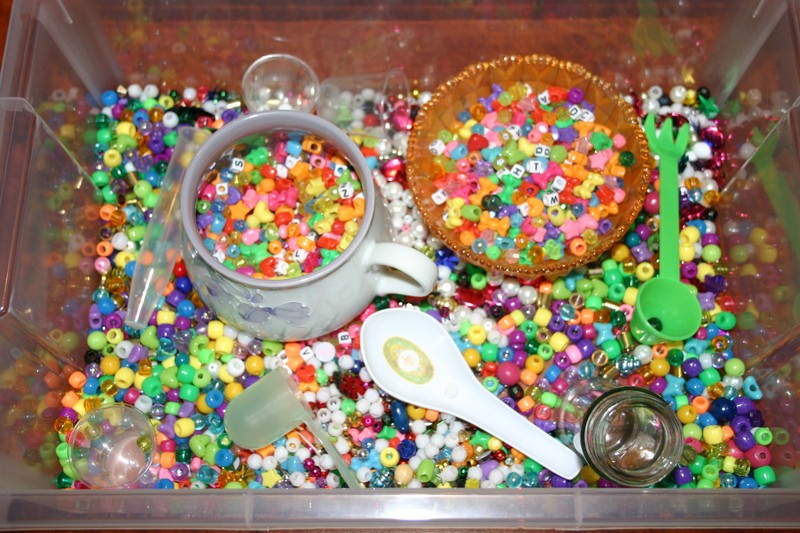 Assorted beads, scoops, spoons, jars, bowls, and cups make an attractive Montessori style dry transfer sensory tub. Now that our long-awaited baby has arrived, planning for uninterrupted breast-feeding times has moved up in priority. We have chosen to keep our flexible routine going throughout these early weeks, rather than taking holidays as we find the children get along so much better with the structure in their day. With Daddy home for a few weeks and a new sister, there is enough change without taking away their daily structure at the same time. With that in mind, I have overhauled the school cupboards with new preschool activities (photos coming soon) in preparation for Daddy heading back to work next week and created a couple of new sensory tubs for quiet afternoon table or mat play. Training my little ones to sit in one place and play with what I give them has paid dividends on many occasions, but especially in times such as these. Knowing that I can sit down and feed with everyone happily occupied means no mess to clean up later and no bickering to deal with. 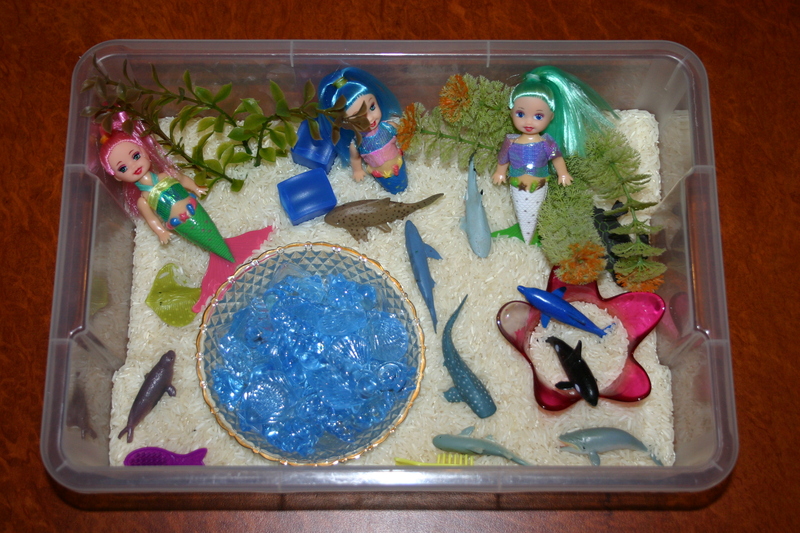 Rice, mermaids, fish tank plants, blue plastic shells, bowls and sea creatures allows much scope for pretend play and imagination. My girls have been drooling over this since they saw me putting it together! I love this kind of activity. It takes approximately 30 seconds to put together and older babies and toddlers love it! Obviously being glass, care must be taken so that it will not drop onto a hard surface. I use my jar for highchair time, in the playpen or for mat time as these all occur over carpeted floors. You may prefer to replace the glass with something metal but make sure it makes a great sound as that is part of the attraction. 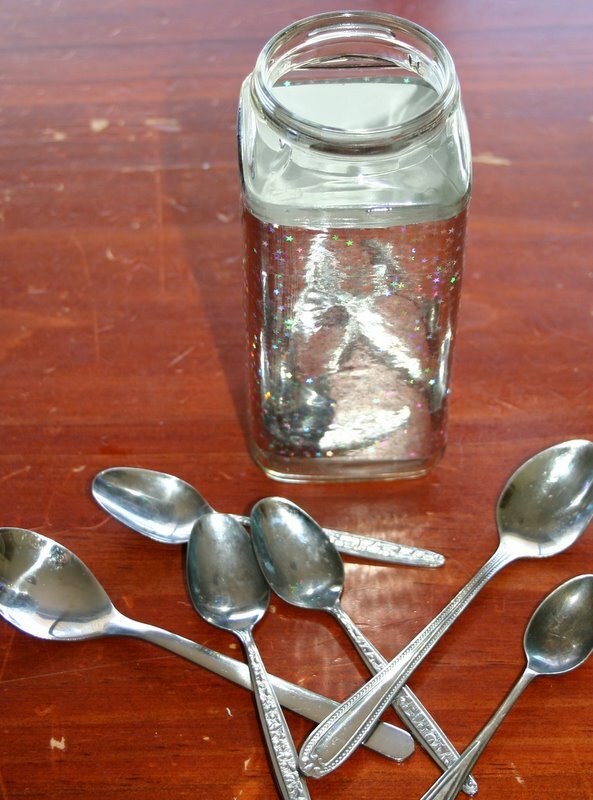 The child drops the spoons into the jar which makes a satisfying jangle and tips them back out again. That’s it! An example of my playpen ready for playpen time. An attractive selection of age appropriate toys - not too many - of different types. My toys are stored in plastic crates so that a good selection of toys of a variety of types are all ready for me to pop into the playpen. Crates are rotated from day-to-day so that interest in the toys presented stays high for quite some time. For those of you who have older babies or toddlers who have not yet been introduced to playpen time, here are some notes on starting late. For a baby or toddler who has had a lot of freedom, the transition to a playpen can take a little time. Make sure it is a good time of day to begin (not when they are hungry or tired) and start will a small increment of time – even 5 minutes. 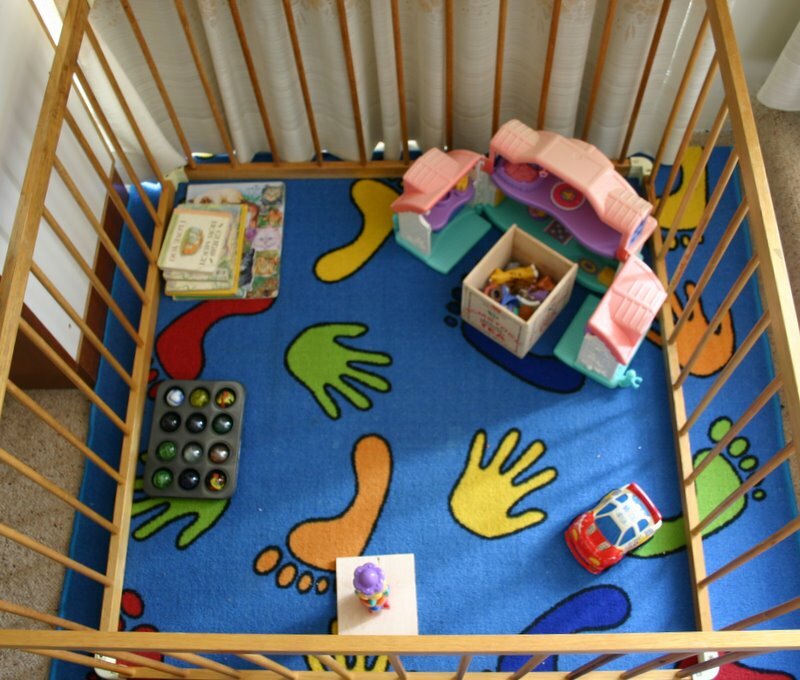 Put in a small basket of toys, or a toy or two in each corner of the playpen, instruct the child that they need to play here and that Mummy will be back to get them in a little while. Yes, they probably will cry and that’s ok. If you are consistent and stick with it, your child will come to play happily for this time. You may like to play a CD or favourite book on tape, letting you child know that they can come out when the CD or story finishes or set a timer and tell them that playpen time will be finished when the timer beeps. Having a cue of some sort to signal the end of playpen time is helpful in the training period because it lets the child know that it is the signal, not their crying, that has decided playpen time is over for the day. Start with the small increment of time and stick to it, coming in immediately once the signal sounds (timer beeps etc.) and with a happy face and positive tone say something like “Playpen time is finished, you can come out now.” A well fed, well rested child, with age appropriate toys is not harmed in any way by a little time in the playpen, in fact it actually helps them to develop those all important concentrating skills that will enable them to learn so many important things later. Initially, have playpen time 2 or 3 times a day for 5 minutes. Once your little one is used to spending this short period of time in a playpen, gradually start to extend the time. Once they are spending longer blocks of time in the playpen, reduce the number of times in a day you use it to two and then once a day. By around 12 months all of my children would happily play in the playpen for around 45 minutes which extended to an hour by the age of 18 months. I have watched them examining objects with intense concentration, seen the cogs ticking as they use it in different ways and investigate everything about it. Babies and toddlers often do not do this for longer than a few moments unless you create situations that foster this skill. Once a child is characterised by happily spending time in a playpen then on odd days you can make exceptions when they are not happy eg. extra tired, sick etc. Although you may be thinking “My boisterous 12 month old will never do that” let me encourage you that they will. There will certainly be a transition time involved, however if you are consistent, playpen time will be a pleasant time for you both. Introducing playpen time as part of a daily flexible routine will greatly improve the success you have with it. Trying to implement one planned moment in a day of chaos and unlimited choices for a child will be very difficult. Time when a baby or young child plays in a safe environment within a set boundary with a selection of age appropriate toys for a set amount of time. Playpen time is introduced as a regular part of a flexible daily routine. Independent playtime away from all other distractions teaches a child how to focus and concentrate on a few selected items, rather than flitting from one activity to another. It teaches them to be content on their own and to know that it is ok to be separated from Mum for a short time – that she will come back. It alleviates the separation anxiety many young children feel when Mum leaves the room because they know through experience that she will return and they will be ok.
Playpen time provides you as a parent with a period of time where you can take a shower, complete some of your own responsibilities or homeschool older children – all the while knowing that your younger child is safe and happily playing with their own toys. How do I introduce playpen time? 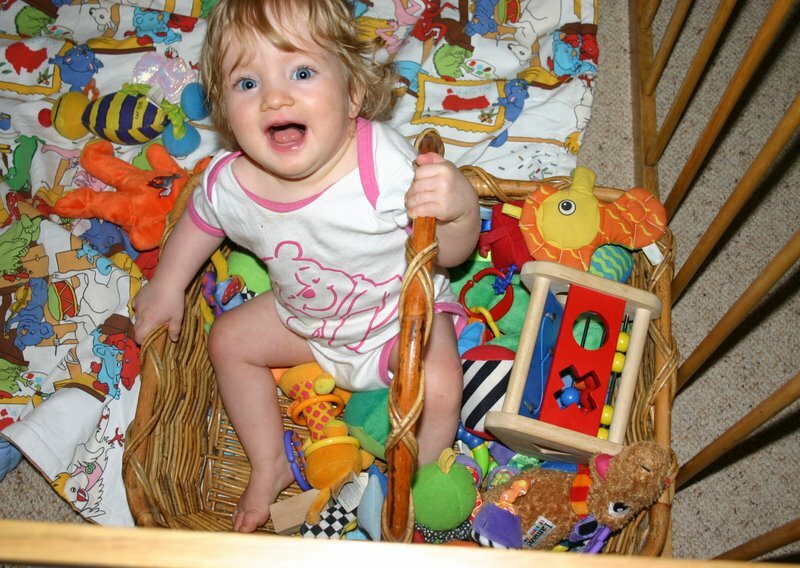 Ideally, introduce playpen time from before your baby can even crawl. (See tomorrow’s post on starting late.) An emotionally healthy baby can lay or sit for a short period of time happily focussed on their own toys in a secure and safe environment. Make it a part of your daily routine, a couple of times a day for 10 or 15 minutes right from a very young age. If you wait until they can roll and crawl to get where they want and then suddenly impose a barrier, baby will be frustrated and let you know. If they are used to spending some time in a playpen every day it will simply be something they expect and happily participate in. Obviously babies need lots of time with Mum and other family members, cuddles, attention and the like – I am not advocating using a playpen continuously throughout the day. It is for planned periods of time and for a reasonable length of time. Somewhere that you can check on your child regularly, but where they cannot see you. Somewhere away from the traffic flow of the house. When siblings or others walk by, a child’s attention is diverted from what they are doing and they will swiftly become discontent with being there. If they see you check in on them, they will likely cry for your attention and want to get out, whereas once settled an uninterrupted child will happily focus for an extended period. When your child is well fed and well rested and at a consistent time each day. Make it a part of your routine so that the child begins to know what will happen throughout the day and is happily ready to go in when that time comes. Choose a small selection of toys. Too much choice means that children will not focus on any one item but swap and change from one to another. Ensure that toys are age appropriate; not too easy or too difficult for them to use. If the toys are not interesting to the child, playpen time will be a struggle. Rotate toys so that there is regularly “new” toys to enjoy. 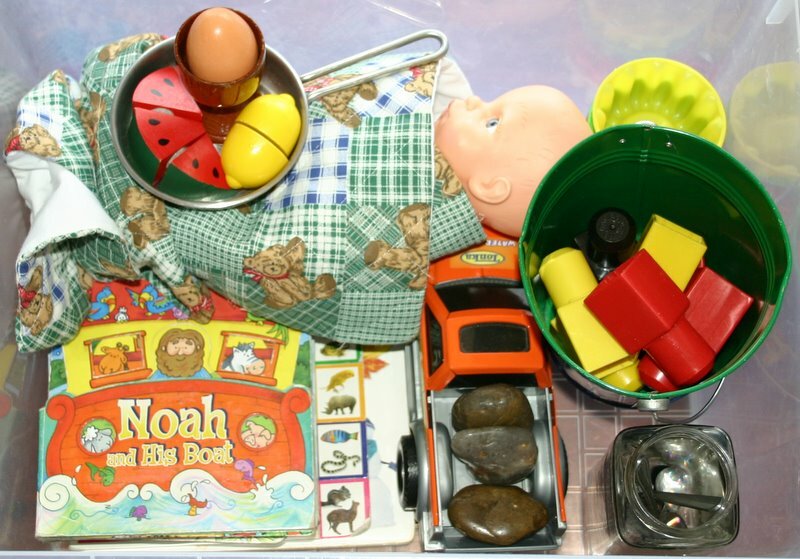 I sort my baby and toddler toys into several plastic crates – one for each day of the week. This way, I don’t have to go though wondering what to put in today – I simply put in the next crate. It also means they only see the toys once a week so they are fresh and interest stays high. When I only had one child, I didn’t have as many toys as I do now so rotating was harder, however I will be adding lots of ideas of toys to make for toddlers and babies so check out those blog posts for ideas. You could also swap toys with friends or join a toy library. Do not expect children to pack toys in to bags or boxes, it is too fiddly and time-consuming. Open baskets and crates are best as toys can quickly and easily be plopped inside. Large toy boxes are also not a good idea as all the toys get jumbled together, pieces are all mixed up and it is very difficult to quickly pull out a good selection for playpen time. See this post on room time. Teach your child to pack up right from the first use of the playpen. Initially it will be you packing away with them watching. Encourage them to help you put the toys away, perhaps placing a small item in their hand and guiding it to the basket and thanking them with a big smile for helping Mummy pack up. It won’t take long for them to understand what you want them to do and you can gradually pull back on the amount of packing you do until the child is completely responsible for this task themselves. Several of my children have been heard to vigorously start throwing toys back in the crate without me telling them to do so – a very clear sign that in their opinion playpen time is done! While this is very cute, it is important that they realise Mum decides when playpen time is done, not them, or they will simply pack their toys away after a few minutes and expect to come out. Following on from this weeks posts about highchair time and highchair time activities for babies, here are some pictures of commercial toys I use with my babies and toddlers for highchair times. Go for a walk around the house and see what there is to collect. If you have older siblings, you’ll be surprised what you can borrow from them to keep a toddler happily playing. Do you want your baby or toddler to be able to sit and focus for an extended length of time? Do you want them to be able to sit and wait patiently during an unexpected delay in a public situation? Do you want time to tidy up the kitchen after meals, clear and wipe down the table and move to the next activity of the day without leaving a trail of devastation that needs to be cleaned up later? Like all behaviours and character traits, we must actively work to build patience and concentration in our children. Highchair time is a practical way to achieve this goal with our little ones. It is easy to consistently implement and work into the daily routine without having to change much at all. After each meal is finished, simply wipe up your child and hand them a book to read or small toy to play with. Around 20 minutes is a good time to aim for and if put into place after breakfast, lunch and dinner, gives you three daily training periods to work on these skills. Initially, your little one may not be thrilled with Mum’s new plan and a common response will be to cry, complain, whine, throw the books and toys down and other such behaviours. If you ignore this kind of behaviour and simply go about cleaning up the kitchen, you will find that over the next few days, your child will be showing great strides towards happily sitting and concentrating on whatever it is you have chosen to give them. If you pick up toys that are thrown down, then a very amusing game of fetch will be instigated. You may leave a child for 5 minutes and then return a dropped toy, instructing them that they need to stay in the highchair until Mummy is ready to get them down. If it is dropped again, leave it there. They will soon come to the conclusion that it is better to have something to do than nothing at all and keep what they have been given. You may need 3 or 4 little toys or books and change them over every 5 minutes or so to keep their interest, however this should be in Mum’s timing, not the child’s. If you have heard about the 4 personality types, you will know that a choleric child loves to be in charge. A lot of the battles you have throughout the day and at bedtime with any child, particularly the choleric child, will be eliminated by instigating a parent led routine throughout the day, rather than allowing your young child to plan their own day or giving them large blocks of free time to fill. An excellent resource for routine planning is Terrific Toddlers by Mel Hayde. It is my “must have” toddler and young child training book and I have gone back to it over and over. It is an easy read but is full of wisdom and excellent advice that will enable you to love the toddler years and eliminate the “terrible two” syndrome that everyone talks about. 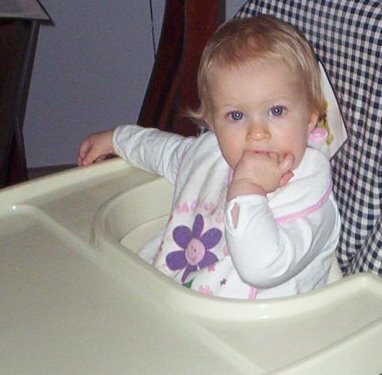 I will be posting ideas of activities to give your little one during highchair time over the next couple of days.